A battery charger is a device that makes a used battery able to be used again. It works by forcing electric current into it from the opposite polarity of the battery. However, only rechargeable batteries can be recharged with a battery charger. Battery chargers can be found in many forms, such as for mobile phone batteries, an electric vehicle charger, and a laptop battery charger (adapter). ↑ "iPhone And iPad Chargers. Lightning Mains And Car Chargers". www.campadelectronics.com.au. Retrieved 27 November 2015. 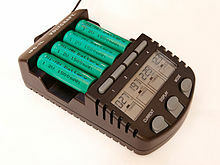 Wikimedia Commons has media related to Battery chargers. This page was last changed on 27 November 2015, at 08:47.